A person could dedicate his entire life studying the history of backgammon. Much has been written about the game over the years. But there is one historical backgammon topic that remains for the most part, a mystery: the introduction of doubling and the invention of the doubling cube. David Levy, in a 2003 GammOnLine forum discussion, references Francis Willughby’s Book of Games: a 17th Century Treatise on Sports, Games, and Pastimes (ca 1660 in England), edited by David Cram, Jeffrey L. Forgeng and Dorothy Johnston, and published by Ashgate in 2003. 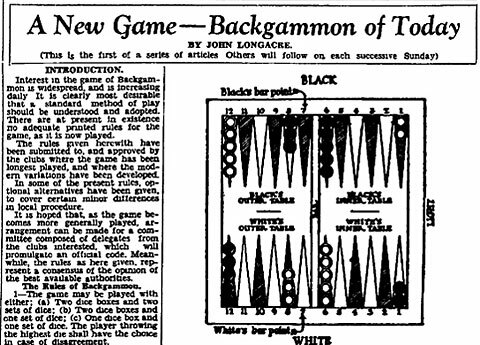 In “Ticktack,” one of the described backgammon-like games, doubling the stakes is part of the rules. The term “vie” means to double. If a player accepts the double, he says “I see it.” Otherwise, he can yield the game. The big difference is that only the initial “vie” doubles the stakes. Future “vies” in the same game triple and next quadruple the stakes. But that is ancient history and doesn’t relate directly to our game. 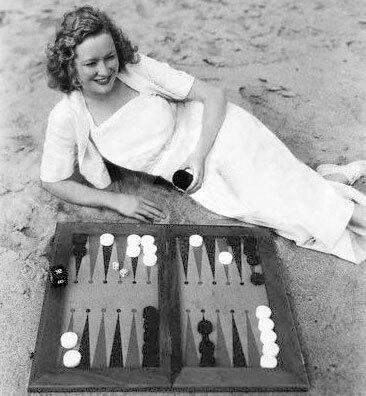 Permitting players to optionally double and redouble the stakes prior to rolling was responsible for backgammon’s resurgence in the United States (and later across the globe) from about 1927 into the 1930s. 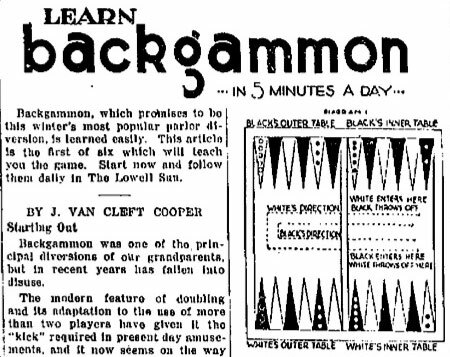 Over the past two years, CHICAGO POINT has collected a treasure trove of backgammon doubling information from old newspapers, magazines, and books. Special thanks to Ed Bennett (who made a trip to the New York City Racquet & Tennis Club and interviewed the older players), Ken Bame, Chris Bray, Frank Frigo, Kathleen Davis, David Levy, Maurice Barie, Vic Morawski, and Grant Schneider for their help in this project. 2. National Geographic Society wire service, “Backgammon Hits It Big,” New Castle (PA) News (June 6, 1973). 3. Mike Goodman, “Backgammon Hustlers--And How They Do It,” Los Angeles (CA) Times (January 26, 1975). 4. Jacqueline Smith, “Oldest Game in History Earns Popularity in U.S. And Gains Followers Here,” Naples (FL) Daily News (April 4, 1976). Note that all of the articles published in the 1970s might have used the 1964 Rushmore article as their reference. (L) Coco Chanel & Grand Duke Dmitri--circa 1921. (R) Grand Duke Dmitri, son Paul, and wife Audrey Emery--Nov. 1931. 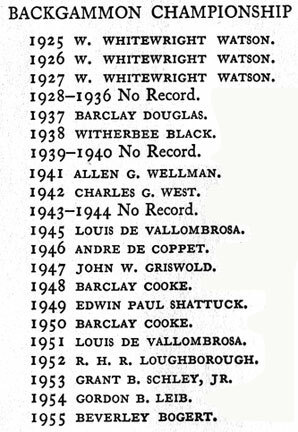 The October 1931 Harper's Bazaar magazine, page 171 [View article] offers the most thorough investgation into how doubling in backgammon came about. 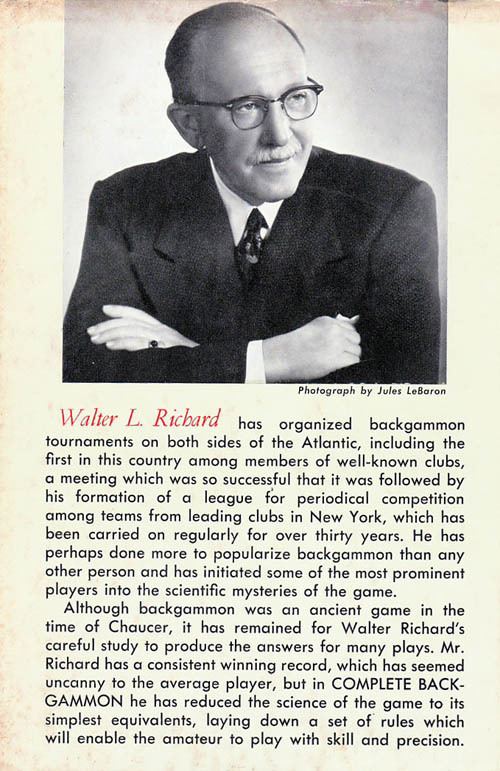 The article titled "The Backgammon Boom" by Walter L. Richard discussed how the introdution of doubling and chouette play was fueling a rapid increase in the game's popularity throughout the United States "over the past two years." We don’t know anything other than what we have read about Walter L. Richard. However, based on that alone, we believe Mr. Richard to have been a reputable man with no agenda other than to provide the most accurate historical doubling information possible based on what was known in 1931. 1. It is impossible to say who definitely originated doubling. Jean Nicolopoulo, described in 1930 as an outstanding backgammon enthusiast of the Travellers Club (Paris), said doubling was employed for years in the East before being tried in Occidental countries. 2. 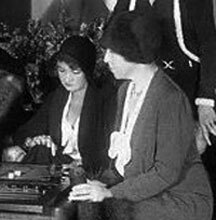 The first use of doubling in Europe (automatic or during play) originated in a game played in Paris in 1926 between The Grand Duke Dmitri of Russia and Aksel de Wichfeld of Denmark. Those two players reported that to them, their idea of doubling was original. 3. Messrs. Dmitri and Wichfeld induced other players at the Paris Travellers Club to adapt doubling and in about 1928, some Travellers Club players went to New York and introduced it to the Racquet and Tennis Club of New York City. Some of the friends of John P. Wemple declared that he was the first to show the new feature to them. Mentioning Mr. Wemple makes sense as the book Racquet & Tennis Club: Some History and Some Memories (1964) by George Meade Rushmore credits him with introducing doubling into the Racquet and Tennis Club. Mr. Rushmore believes the introduction occurred in 1925, but Mr. Richard writes that doubling was introduced in 1928. 1928 cannot be correct because the 1928 edition of Modern Backgammon [see below] discusses the introduction of doubling (and chouettes). 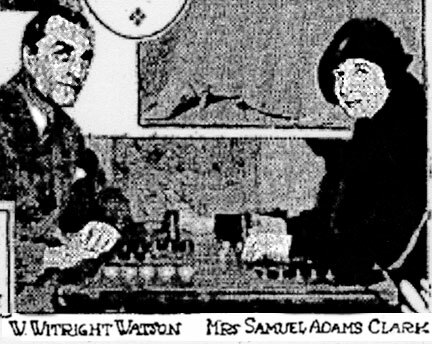 Since Modern Backgammon includes a foreword by author Grosvenor Nicholas dated January 4, 1928, the advent of doubling in the United States must have occured prior to 1928. 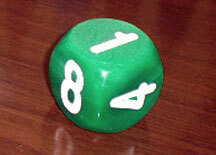 (L) Backgammon matches (sometimes made of bakelite) were used for scoring prior to the doubling cube. 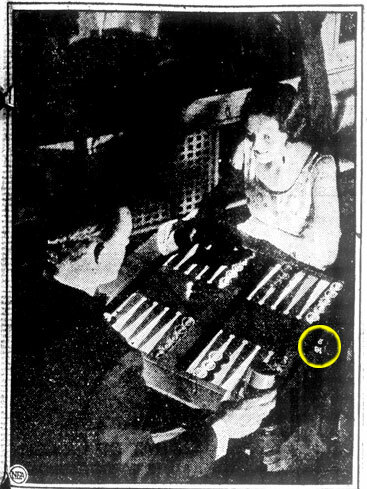 (R) Collier's April 11, 1931 cover illustrated backgammon being played using a container of scoring matches. 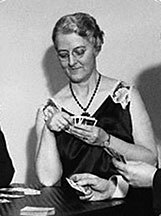 Elizabeth Clark Boyden playing bridge in the 1930s. Lelia Hattersley (R) teaching back-gammon circa early 1930s. (L) Scoring dial owned by Chris Bray. (R) Douglas Fairbanks, Jr. and Joan Crawford at their home in 1931 using a scoring dial to keep track of backgammon doubling. (L) The peg board was another method used for scoring backgammon. (R) A couple scores their game with a peg board cruising on the Conte di Savoia passenger ship in the early 1930s. Beginner's Book of Modern Backgammon by Ralph A. 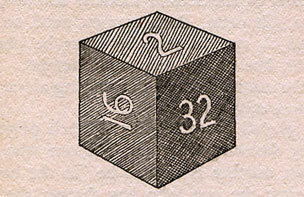 Bond was the first book to illustrate a doubling cube. 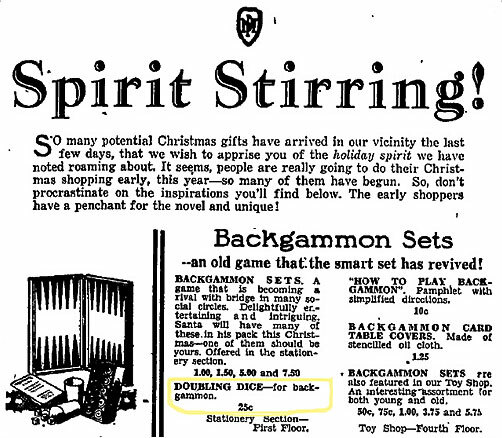 A 1930 pre-Christmas advertisement for backgammon equipment including a doubling cube. 1. 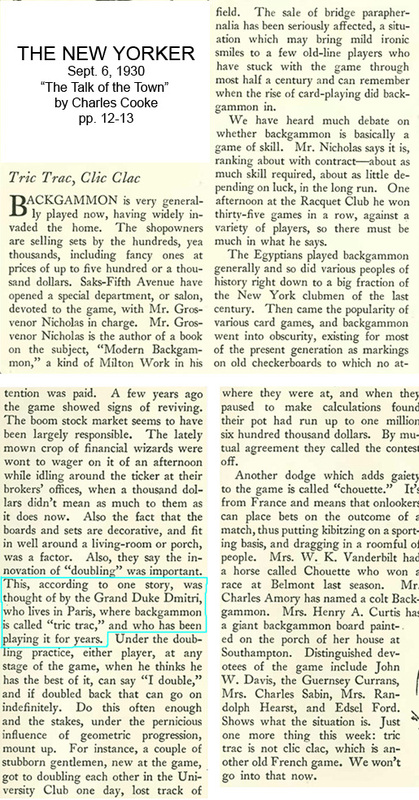 Grosvenor Nicholas, Modern Backgammon (foreword dated Jan. 4, 1928), page 35. “Before concluding this chapter, we must mention one more recent development in connection with doubling. This is known as the automatic double. 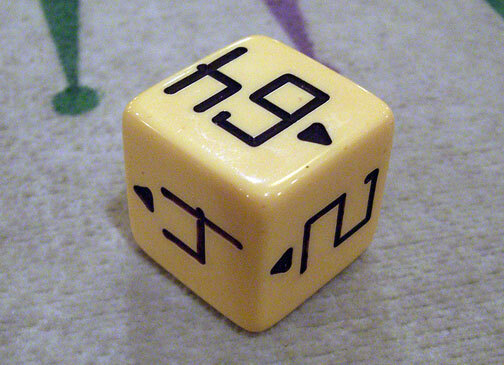 The "64" has been replaced with a "1" on this type of doubling cube. (L) The late George Barr's doubling block that belonged to his father. (R) Married couple Jennifer Jones and Robert Walker play a game of backgammon in the early 1940s using a half cube. 1. 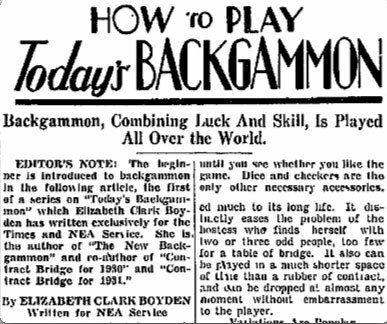 “How To Play Today’s Backgammon” by Elizabeth Clark Boyden. 2. “Learn Backgammon in 5 Minutes a Day” by J. Van Cleft Cooper. 3. “Backgammon of Today” by John Longacre (reprints from his book of the same name).